Today I was working in the lift as I have been doing often these days and realized that I might just be too comfortable. Some know that I’m not a big fan of heights. My friend Eric knows this two well. A number of years ago Eric and I were in Prescott, Arizona and Eric decided that he wanted to bungee jump. Now doing this didn’t interest me at all, but Eric talked me into riding up in the crane to about 75′ or 100′ feet above the ground. I was scared out of my mind and I was not even jumping. Eric looked over at me and I was clinging to the sides of the basked and was white as a sheet. He didn’t even get to see the worst of it. When Eric jumped the entire basket was shaking all over the place. I almost needed to clean out my shorts after that. We currently have three on the technical production team and each of us maintains different areas of the campus. My area is the worship center. Just to give you some perspective, the floor of the worship center to the front of house trusses is about 35 to 40 feet. Needless to say I was wondering if I would be able to handle this part of the job. It has taken until recently, but now I don’t think twice about going up and fixing things. Now I question that maybe I might just be too comfortable. Since I started working in the air I wished that my fear would subside. But now I realize that a little fear is a good thing to keep us in the safe places. Just like the fear we should have in the Lord. We had three amps go down this week. 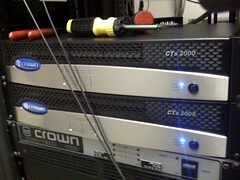 So John installed three new Crown CTs amps in the racks and we did a rough balance. Tomorrow we will go back in with fresh ears and fine tune the system. So far we think that it is already sounding better. Let see what our ears say in the morning. Nothing like a car fire and evacuation during your dinner at the staff retreat. 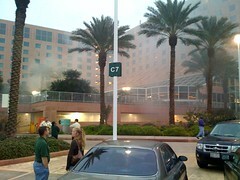 We are here at Moody Gardens in Galveston and a fire alarm interrupted our dinner. Now we are headed out for burgers. Last Wednesday, I moved the lift to the front of house and started working on refocusing the lights on the FOH trusses. While I had it out, I was planning on replacing the burned out lamp in our 12oo watt mover. After replacing the lamp, the fixture would still not strike. Not good! Well, that means that it is time to take it down and see what it wrong with it. Taking it down is not that fun being that the fixture is about 35 feet in the air on a truss that we can’t lower. Yes I would love to have chain motors. Got to give thanks to one of our lighting volunteers, Greg, for taking it down. Let me tell you that is a very heavy light. When Greg got the instrument on the ground he started taking it apart for cleaning. After removing a panel on the side of the head, Greg found some burned leads and what we think is a temperature sensor that was also burned out. Could it be a symptom of a bad part, or is this just a sign of a bigger issue with the instrument? More to come later.